With CDC Help, Puerto Rico Aims To Get Ahead Of Zika : Shots - Health News So far, the U.S. territory has reported 117 Zika cases, including five pregnant women. But health officials say the real test will come when April and May rains bring more mosquitoes. 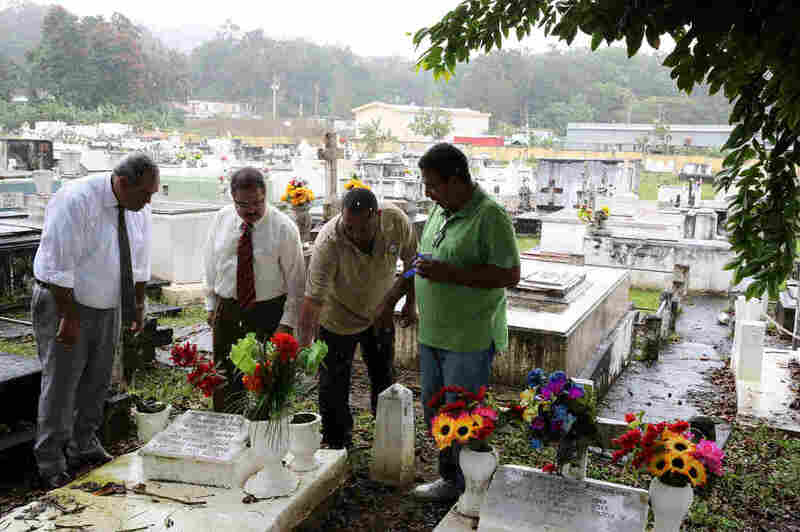 Previous experience with dengue outbreaks in Puerto Rico has shown that even small amounts of standing water — as in the vases of cemeteries — can serve as breeding areas for the mosquitoes that carry dengue and Zika. "No one seems to be paying much attention to it," she says. Compared with other tropical diseases carried by mosquitoes, such as dengue or chikungunya, the symptoms of those infected with Zika are usually mild. Only about a fifth of those infected actually get sick. But at least one person with Zika in Puerto Rico has developed a neurological disorder, Guillain-Barre, which may be linked to the disease. Zika is especially concerning for pregnant women because it may cause birth defects — in particular, microcephaly. Arlene Coto is in her last trimester and worried. She had just come from seeing her doctor. "He says not to be alarmed," she says. Still, she's taking steps at home to protect her family from mosquitoes. "We have to fumigate and use repellent." Like many in Puerto Rico, Coto doesn't have screens on her windows. That's something the island's government is working to address, with help from federal authorities. Puerto Rico is installing screens in the island's high schools and plans to make screens available for the homes of pregnant women. "We have to do what we didn't do for 30 years in 45 days," says Dr. Johnny Rullan, Puerto Rico's former secretary of health. Rullan is an epidemiologist trained by the Centers for Disease Control and Prevention and is advising the government on its Zika response. While Zika is new to Puerto Rico, the island has extensive experience with other tropical diseases, including dengue, which infects thousands of Puerto Ricans each year. Faced with several dozen Zika cases, the island's government has done something it has never done with dengue. It has declared a public health emergency. There's good reason for that, Rullan says. Pregnant women are being infected now. "People don't understand that the battle is going to be in October," he says. "If babies start being born with microcephaly in October, November, December, we lost the battle. Prevention has to be nine months ahead." More than 90 percent of pregnant women in Puerto Rico receive nutritional services though government-run centers, Rullan says. All these women will be screened for Zika, and any found to be infected will be monitored. Rullan has closely followed the progress of one of the pregnant women infected with Zika. "She will be tested at Week 16 with an amniocentesis," he says. "Every four weeks, she'll have a sonogram." Puerto Rico isn't facing Zika alone. A team of stateside researchers has been dispatched from the CDC. In addition, the 70 employees of the CDC's Dengue Branch, which is located on the island, are now focused on Zika. Dr. Dana Thomas, an epidemiologist with the CDC, is working in the office of Puerto Rico's secretary of health to monitor Zika's spread. When chikungunya hit the island in 2014, it was during the rainy season. Thomas says it took just four months for the disease to spread throughout Puerto Rico. Because the majority of people don't show symptoms, Thomas says, tracking Zika is more problematic. The worst may still be ahead. "We picked this up technically in our dry season," she says of the first Zika cases in Puerto Rico. "So the question is, 'What will happen in April or May as we have more rain and potentially more mosquitoes?' "
Complicating Puerto Rico's fight with Zika is the island's financial crisis. To deal with its massive debt, Puerto Rico has laid off thousands of public employees in recent years, including many in public health. To help the island meet the challenge, the Obama administration is asking Congress for nearly $500 million. That's money that will be used to shore up the health care system and support Puerto Rico's fight against Zika.